Since starting my elimination diet, I’ve struggled to think of easy breakfast ideas for the week. The whole not being able to eat eggs thing has really put a damper on most of my go-to breakfast recipes. While brainstorming I remembered how I used to make baked oatmeal and reheat it for quick breakfasts during the work week. And then I thought why not try to do that with quinoa? Let me tell you, it took a few trials, but I think we’ve got a winner here! This baked quinoa recipe is super easy to throw together for a weekend brunch or to make for breakfasts throughout the week. I love how customizable it is and can’t wait to start experimenting with different versions! This version works quite well as a basic recipe. 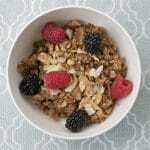 I love to top mine with some fresh berries, toasted coconut and toasted walnuts. Though I think a drizzle of honey or brown sugar would be divine on top, as well! This baked quinoa recipe is super easy to throw together for a weekend brunch or to make for breakfasts throughout the week. An easy and healthy breakfast quinoa that is gluten-free, dairy-free, and vegan! Preheat oven to 350F. Grease a casserole dish (6 cup at least) or baking pan 8x8 inch would work with coconut oil or other oil. In a large mixing bowl, mix together all of the ingredients. Dump quinoa mixture into the greased baking dish. Bake at 350F for 40-50 minutes. Mix the quinoa every 15 minutes or so. I've only tried this recipe with stevia, but if you are able to eat honey or maple syrup it would work really well in this recipe. I would suggest starting at 2-3 tbsp but taste as you go. You can always add some more on top after baking to sweeten it a bit.